What are the Thai breakfast foods you should try on your trip? The answer depends on whom you ask. “Breakfast” in Thailand is loosely defined as any food you happen to eat in the morning. If you eat a spicy curry first thing in the morning, well, it’s officially a breakfast food. That said, there are some foods are enjoyed more frequently in the morning. Grab-and-go items, especially the sweet ones, are popular as people hurry through sidewalk markets on the way to work. When there’s time to sit for a meal, hot soups and porridge are more enjoyable in the morning — no one needs additional help sweating on Thailand’s hot afternoons. Breakfast (อาหารเช้า) is pronounced “ahaan chow” in Thai, but you won’t need to ask for a breakfast menu. Just order what you feel like eating! Aside from Thai-style omelets, jok (pronounced: “joke”) is probably the Thai breakfast food most closely resembling a Western breakfast dish. But unlike your typical oatmeal, this savory rice porridge gets spruced up with ginger, poached egg, green onions, and minced pork. The thick texture and hot temperature of jok make it a comfort food best enjoyed before the heat of the day. You’ll find vendors cooking large batches of jok in almost every morning market. Khao tom (rice soup) is also made from rice, but unlike jok, khao tom remains thin and is less congealed. Khao (pronounced “cow” not “koh”) means “rice” in Thai. Rice soup does indeed contain some broken rice, but the real stars of the dish are thinly sliced ginger, flavorful Chinese celery (similar to coriander/cilantro) and either pork (moo), chicken (gai) or shrimp (goong). As a thin, salty soup that’s easy on the stomach, khao tom enjoys some notoriety as a hangover remedy. It’s a go-to morning dish after too much late-night fun with friends. Thai omelets aren’t folded as are their Western counterparts. Instead, simple ingredients get beaten into the eggs (kai) then wok fried until the edges are crispy. Flour or starch makes the omelet thick and fluffy. Liberal amounts of hot oil give the omelet more of a deep-fried texture. Thai omelets are typically served plain and simple atop jasmine rice. As with all the Thai breakfast foods, you’re likely to see locals eating kai jeow any time of day, not just in the morning. Heads up, doughnut fans: The Thai snack pa thong ko (or patango) borrowed from China is the closest thing to doughnuts you’ll find made at street carts. If you see white flour scattered across a big surface next to a wide vat of frying oil, you’ve probably stumbled upon a pa thong ko cart. Fingerlings of fluffy dough are deep fried to produce this inexpensive snack. Pa thong ko is often enjoyed with — and sometimes even dipped in — coffee or soy milk. They also compliment bowls of jok. Moo ping (pork) and gai ping (chicken) sticks are an expedient, grab-and-go protein fix often consumed at breakfast. Just like satay sticks enjoyed in Malaysia, these skewers are marinated, grilled, and served with a spicy dipping sauce. Khao niao (sticky rice) can be included; it adds some carbohydrates, and like the sticks, can be eaten with the fingers. At around 25 cents a skewer, moo ping is an inexpensive compliment to any of the Thai breakfast foods you try on your trip. Like anywhere else in the world, people in Thailand don’t always make time for a sit-down, cooked-to-order breakfast. Locals who want a hearty morning or midday meal will often hit a khao rad kaeng stall. The smorgasbord of meats, fish, veggies, and sauces is usually prepared offsite, carried to the market, then spread out in warming pans. You begin with a base of rice then pick out two (the default) or three items to top it. The rad in khao rad kaeng sometimes gets transliterated from Thai as rat, but don’t be nervous about the meats. Pork is probably the default, although you’ll see plenty of fish and chicken choices. Because offerings are usually prepared early and transported to the market, going for khao rad kaeng earlier in the day may increase your chances of scoring fresher food. Bad news morning cereal-eaters: Dairy is largely absent in Thai cuisine. The milk powder quietly added to processed 7-Eleven snacks doesn’t count. That said, soy milk has garnered quite a fan base in Southeast Asia as a nutritional beverage consumed at breakfast. Predictably, you’ll see soy milk sold as a drink in small cartons. But you’ll also spot street carts selling soy milk with a variety of optional additions. Peeled fruit, seeds, and even jellies are among the choices for toppings. As with many beverages in Thailand, sugar often gets added. Although they can be enjoyed anytime, the small coconut pancakes known as kanom krok are a convenient, finger-food snack frequently eaten at breakfast. Rice flour, coconut milk, and sugar are combined into a sweet pudding that gets poured into a purpose-shaped cooking plate. The sweet smell of kanom krok being prepared wafts through every street market in Thailand. Don’t turn to kanom krok as a miniature replacement for pancakes from home. They’re much sweeter, and unlike the average pancake, sometimes get topped with sweet corn or spring onions. Dim sum and bao obviously aren’t Thai creations, but that doesn’t stop them from being regularly consumed as a quick breakfast or lunch. The Thai version of dim sum and steamed buns is known as salapao. Some are savory and filled with meat or shrimp; others are stuffed with a sweetened bean paste. You can sometimes guess what’s inside a bun by looking at the color of the filling hole at the top. At other times, you’ll have no idea what you’re about to eat. Locals seem to intuitively know the contents based on color and shape. Ask the vendor or take a chance — the learning curve is going to be delicious. When eating an oily dish early in the morning sounds like too much, fruit comes to the rescue! 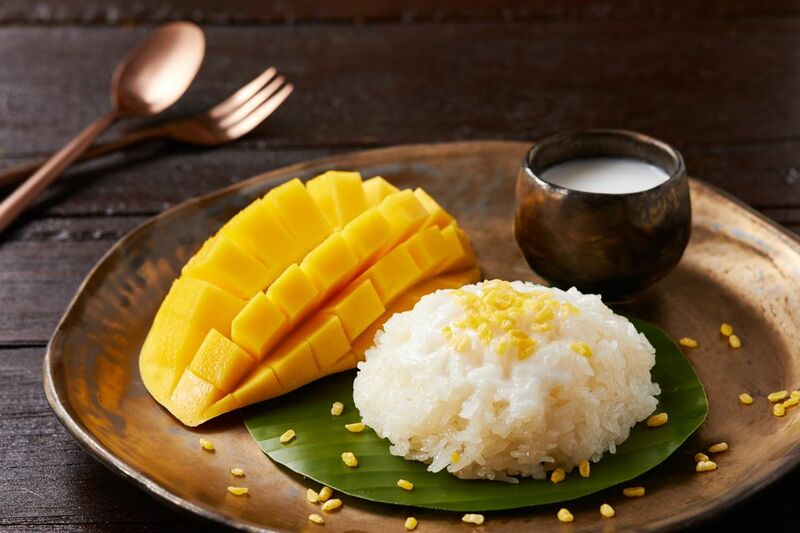 Mango on sticky rice is a favorite dessert dish that works for breakfast, but you’ll find an amazing array of fresh fruits available in the markets. Even a meager banana enjoyed in Thailand will give you a whole new appreciation for just how good locally grown fruit can be! Many types of fruits are best enjoyed when in season during Thailand’s rainy months — although papaya, guava, bananas, and dragonfruit are four notable, year-round exceptions. Rayong Province is reputed for producing the best fruit; Rayong town hosts an annual fruit festival in May. As a precautionary measure against TD, opt for fruits that can be peeled; washing, even with safe water, isn’t enough. Be warned: A single mangosteen enjoyed in season could cause you to extend your time in Thailand.